HP 920XL CD975A Remanufactured High Yield Black Ink Cartridge w/Chip USA - Oklahoma Toner Co. L.L.C. HP 920XL CD975A Remanufactured High Yield Black Ink cartridge with aftermarket chip for proper ink level readings and less pop up messages (1,200 Yield). For Use In: HP Officejet 6000 - E609a, 6000 Wireless - E609n, 6500 - E709a, 6500 Wireless - E709n, 6500 Wireless - E709n, 6500A - E710a, 6500A Plus - E710n, 6500A Plus - E710n, 7000 - E809a, 7500A - E910a InkJet Printers. Guaranteed to produce sharp, clear and professional printing results. The use of compatible supplies does not void your printer warranty. Remanufactured to meet the highest standards. 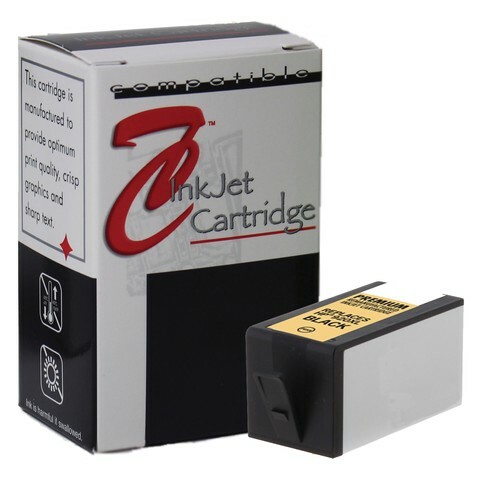 Purchasing our remanufactured toner cartridges will meet your expectations, and is an excellent way to save money.